MAKES 1 POTATO Don’t think twice. Make this recipe by Victoria Granof once and it’ll be a favorite. It’s just that good. A wholesome, filling side, it doubles as one of our favorite light meals—perfect for the bag lunch or a simple, guiltless indulgence. Plus, with its sweet-savory flavors, it’s like dessert for dinner. FYI, Japanese sweet potatoes, or boniatos, have purplish skin, white flesh, and faintly sweet but still starchy character. They’re also fully loaded with vitamins and minerals. Preheat the oven to 425ºF. Scrub the potato, dry it, and pierce it in a few spots. Rub it with the sesame oil. Place it on a rimmed, parchment-lined baking sheet and bake for approximately 45 to 50 minutes, or until tender. Remove the potato from the oven and carefully slice off the top third of the potato, lengthwise. Scrape the flesh from the top piece into a small bowl and discard the skin. Scoop out the flesh from the rest of the potato, leaving a ⅓-inch layer of flesh so the potato doesn’t collapse. Add the butter, miso, maple syrup, and cayenne to the bowl and mash them with the flesh until combined, then pile the mash loosely back into the potato. 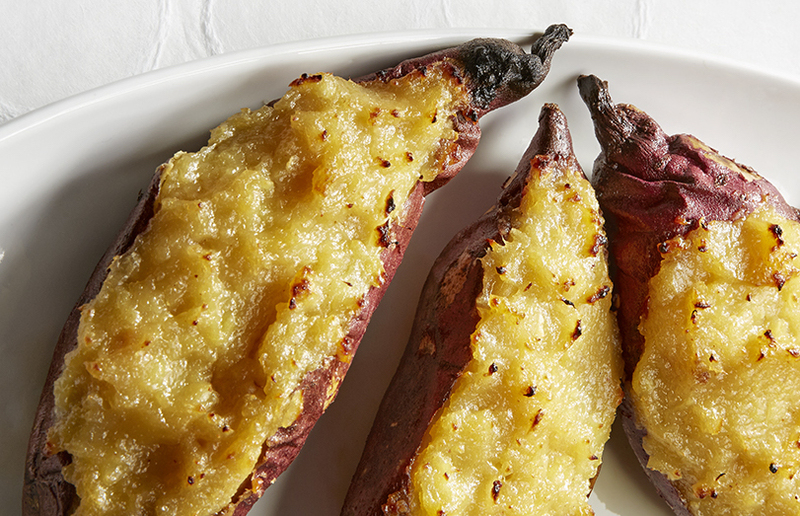 Return the potato to the oven for 15 minutes, or until the top is browned and crispy. Serve warm or at room temperature. Want more of Chef Victoria Granof’s lavish, winter dining recipes? Get the Winter 2015 print or digital issue here!